Sweets [like garlic] contain compounds that can't be broken down by the body, and so are excreted through the skin. In the sweets, the key ingredient is geraniol, a naturally occurring compound found in plants such as roses, lavender and vanilla. Munching on the sugar-free tangerine-flavoured candy will, apparently, turn you into a living perfume atomiser. Deo sweets, which will soon be available in retail locations across the US for a cool $10 per tiny pastel package, have already been successfully marketed in other countries like Spain, Germany, China, Korea and Armenia. And it isn't the only edible perfume out there — there's a Dutch company called Swallowable Perfume, which is trying to develop capsules that, when ingested, will give the swallower a "genetically unique" scent, and there once, up until its discontinuation, existed a Japanese chewing gum called "Man Scent" that would make chewers smell like flowers (very manly flowers) for up to two hours. Still, there are so many questions! 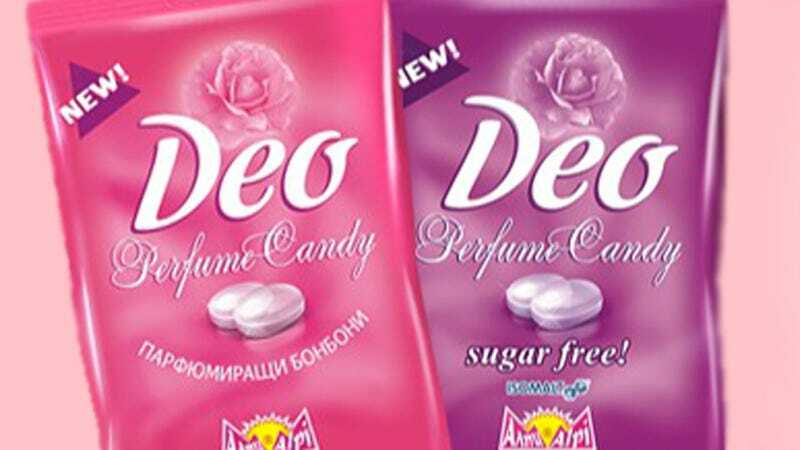 Does Deo candy make your skin taste like perfume? Will they start making the candies in other attractive scents like leather, Christmas or bacon? When people in the future look back on the 21st century, will they talk about perfumed candy in the same way we talk about people in the past swallowing tapeworms (also all-natural!) to lose weight or carrying pockets full of posies to hide their plague stench? And lastly, does this mean I never have to shower again? Coooooool.